RIO DE JANEIRO, BRAZIL – Sunday, February 5th, NFL Football fans will witness one of the biggest sporting events of the world; the 46th Super Bowl. The New England Patriots meet New York Giants at the Lucas Oil Stadium in Indianapolis in a contest out of storybooks as both teams have a lot to prove as northeastern (U.S.) rivals. 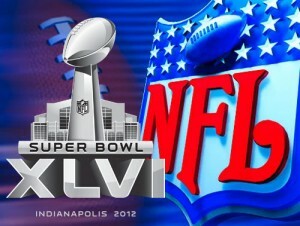 The 2012 NFL Super Bowl XLVI on Sunday in Rio at 9:30 PM, image recreation. Kick-off time is 9:30 PM in Rio, and the festivities include a half-time show from pop icon Madonna. The spectacle will be broadcast on sports channel ESPN Brazil, as well as in gringo-friendly bars across the city’s Zona Sul (South Zone). The slight favorites going into Sunday’s showdown are the Patriots, who will be looking to avenge their failure of five years ago. The contest sees a rematch of the 2007 final, when the Giants emerged victorious, upsetting the odds hugely. In their attempt to avoid more heartbreak, the Patriots will look to quarterback Tom Brady (married to Brazil supermodel Gisele Bündchen) to lead, ably supported by strong tight end duo Aaron Hernandez and Rob Gronkowski. The Patriots game is lead by their excellent passing ability, and will also be looking to receiver Wes Welker to move the ball against New York. If the Giants are to succeed again, it will start with their punishing defense, and with quarterback Eli Manning, receivers Victor Cruz and Hakeem Nicks looking to lead their fast paced counter offense when possible. Of course the Giants still have running back Brandon Jacobs, a pivotal member of their 2007 upset. While ESPN Brasil will air the game (in Portuguese), many NFL football fans prefer to watch amongst friends. In Copacabana and Ipanema, two of the city’s most densely populated areas for expatriates and travelers, there are a number of options. 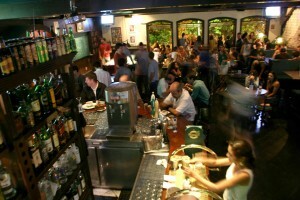 Shenanigan's Irish Pub & Sports Bar in Ipanema hosts the biggest Super Bowl party, photo provided by Shenanigans. Another option is the Mexican themed bar Blue Agave. The establishment now boasts two locations, one on Rua Vinícius de Moraes in Ipanema, with the newer branch opening on Rua Aires Saldanha in Copacabana, and both will have the game on. Due to space limitation, entrance at the Ipanema location for Sunday night’s celebrations will be R$10 per person. In addition to their usual menu, for the Super Bowl parties at both locations they will have wings and burgers. For those looking to watch the game amongst a calmer environment, the Marriott Hotel, situated on the beach front in Copacabana, will offer a more refined setting for NFL enthusiasts. The hotel is offering a buffet, seats and two large screens for those who want to focus entirely on the game. Other locations to watch the Super Bowl in Rio will be the Gringo Cafe, are Lord Jim Pub and Banana Jack’s in Ipanema, and the Mud Bug (two locations) in Copacabana.